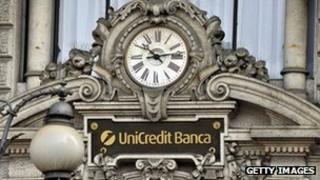 Unicredit has confirmed it is co-operating with a US investigation into a possible breach of sanctions. "A member of the Unicredit group is currently responding to a third party witness subpoena from the New York County District Attorney's Office in connection with an ongoing investigation regarding certain persons and/or entities believed to have engaged in sanctionable activities," the January filing said. According to Unicredit's latest statement, which does not name Iran either, the investigation is also being conducted by the US Department of Justice. Then, earlier this month, Standard Chartered Bank - which is headquartered in London, but mainly active in the Middle East, Africa and Asia - agreed to pay New York regulators $340m (£217m) to settle claims that it had concealed $250bn in transactions with Iran. Banks around the world are facing allegations of inter-bank rate rigging, lax anti-money laundering controls and contravening economic sanctions. But which banks are in the frame, for what - and by which regulators? Germany's Commerzbank also warned last week that it may have to make a hefty payment to settle a US investigation into its own violations of sanctions on Iran and other countries. Press reports earlier this month suggested that another German bank, Deutsche Bank, is also being investigated by the US Treasury's Office of Foreign Assets Control, the Federal Reserve, the US Justice Department and Manhattan's district attorney's office for alleged infringements of US-Iran economic sanctions. Iran has been subject to US economic sanctions since 1979. The current system operates under the US Treasury Department's Office of Foreign Assets Control. The sanctions were toughened in 1997 by then-President Bill Clinton, who signed an order for sanctions that prohibited "virtually all trade and investment activities with Iran by US persons, wherever located". Under US criminal law, violations of the Iranian Transactions Regulations may result in a fine up to $1m and/or jail for up to 20 years. The UK-based bank said that not only did "99.9% of the transactions" relating to Iran comply with U-turn regulations, but that the total value of transactions that did not comply was under $14m - converse to the $250bn worth of Iran transactions US regulators said it had hidden. In July, a US Senate Committee found that HSBC carried out 25,000 transactions totalling $19bn that were connected to Iran between 2001-07, which it suggested was evidence that the bank may have broken economic sanctions. Global banking scandals: Who is under scrutiny?